Total Quality Management, games, hands-on experience of the concept of TQM. Total Quality Management games,are games played during a session on TQM to give participants an experience of the concepts of TQM - total, quality, and management. Total - Involvement of every stakeholder in the team or organization. Quality - as determined by the customer or the user. Management - involves a process that is primarily data-based. Let's look at a game/activity that illustrate these concepts. A successful egg-catcher is one which will keep the egg whole even after dropping from 6 ft.
Each group gets three trials to succeed. The area around the egg-catcher should never be dirty. Nobody should be hurt during the game. They have an hour to complete the task. They have twenty Rupees/dollars (play money) to buy the material they will need. Everymember of the group should be involved at every stage of the game. The groups will be assessed on their Quality statement, quality of their egg-catcher, the record of involvement of every member at every stage of the game and the data used to make the egg-catcher. First Stage of the Total Quality Management Game: Ask each group to write a list of characteristics that describe a good quality raw-egg-catcher. Ask them to transform the list into a quality statement. Second stage of this Total Quality Management game: In the next round ask them to list the materials they will need to make the egg-catcher. This chart should have data on unit costs of the material and total costs. Having written this up, they are now ready to buy the material. Third stage this Total Quality Management game: They have to start making the egg-catcher and are ready for the trial as soon as they have made the tool. After every trial the group has the opportunity to review data and improvise their tool until the third and the final trial. The group that fulfils all the conditions given above is declared to be successful. Use the debrief to illustrate the concepts of 'total', 'quality' and 'management' in this Total Quality Management game. Create your own Total Quality Management games by thinking of a similar fun activities. Let us know when you do so. Following is a sample Quality Statement on a comprehensive Mental Health Programme for schools, developed by a set of students (Post Graduate Diploma in Guidance and Counselling). 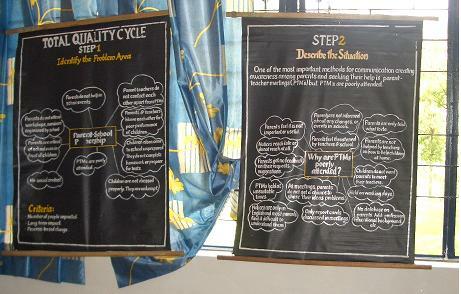 The context was a training to use Total Quality Management in setting up Quality Mental Health programme in Schools. Total Quality Manangement Game described above was replaced by the activity (based on the consensus process) of developing the following statement. General aspects: The school will create a child friendly environment, that is nor stressful to the child. The syllabus is age – appropriate and the curriculum maintains a healthy balance between meaningful leisure and work. It is constructed in a way that will prevent the occurrence of mental health problems. Therefore other than academic areas, the curriculum also includes a quality physical development programme, life skills programme coupled with vocational education for senior students, continuous comprehensive evaluation. Specific aspects: The programme is housed in a learning centre. The centre has child friendly infrastructure, airy, spacious and conveying the principle of confidentiality. Programmes offered by the centre are developmental (therefore continuous and progressive), need-based, working at primary, middle and secondary levels. Continuous evaluation is planned and administered in consonance with such a programme. The evaluation will involve holistic assessment and treatment of mental health issues. This will enable identification of learning problems at early stages, which in turn will facilitate the planning and implementation of early interventions. The programme helps to build and enhance the self-esteem and the positive self-image of the child. It will cater to the needs of teachers as well. Counselling in all areas is part of the programme. It is age and development oriented, i.e. uses multiple approaches that are customized and individualized to the needs of the child. Professional counselors and special educators will implement the counseling programme. Parent participation is crucial to the success of the programme. They are involved in the programme by becoming part of parent support groups. They are also encouraged to attend group and individual counseling sessions for parents. The programme will also offer sensitization sessions for teachers, parents, staff and children. The institution/school assesses the current gaps in resources/skills/facilities to establish a good Mental Health programme. Based on the results of this needs analysis the school either opts for an upgradation or a complete restructuring. The centre also focuses on networking with resource agencies. This will enable the creation of a resource database of people and agencies that can be accessed for conducting workshops and training sessions. This database will also provide information on resource people for referral purposes. The Total Quality Management Training concluded with the participation of partner school contextualising the above for their needs through a participatory process.